According to PetMD, gingivitis is quite common in cats, occurring in more than 80 percent of cats 3 years or older. The good news about the earliest phase of periodontal disease is that it's reversible with proper care. There are a variety of home remedies you can use to keep your cat's teeth and gums in good working order. Brush her teeth for good dental health. The gum pocket is more formally known as gingival sulcus. As it's familiar name implies, it's the small space between the inside of the gum and the tooth. Your cat eats daily, likely without brushing her teeth. Plaque forms on her teeth and under her gums. Over time, her gums respond by swelling while the accumulated bacteria in her gum pockets release toxins that destroy the gingival tissue. And so it is that she has gingivitis, marked by inflamed gums, bad breath and plaque and calculus on her teeth. Old age, soft food, crowded teeth and diseases such as diabetes and autoimmune disease also can cause gingivitis. 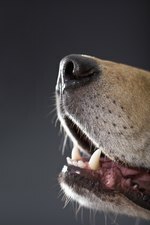 Traditional veterinary treatment often entails teeth cleaning and occasionally, extraction. Natural supplements offer a variety of options to minimize inflammation and act as anti-microbials. If your cat's gums are inflamed or bleeding, a cotton swab of tincture of calendula, feverfew or echinacea generously applied to your cat's gums two to three times a day will give her relief. Grapefruit seed extract is anti- many things: bacterial, fungal, inflammatory, microbial and parasitic, making it an ideal home remedy. Mix two drops with a teaspoon of coconut oil or with a tablespoon of water to make a solution to be applied to her gums with a cotton swab two or three times daily. When you choose your tinctures, be sure to use alcohol-free versions. Dr. Karen Becker of HealthyPets.com notes that diet can help inflammatory dental issues in cats. She recommends feeding an anti-inflammatory diet that eliminates biologically unnecessary foods for cats, including carbohydrates and starches. You also can try some of your own food on your cat, such as apples -- no seeds, please -- carrots or celery, which clean the teeth and remove bacteria. If your cat likes a bit of fruit, specifically citrus, melons and berries, offer her a little spoonful -- vitamin C creates an inhospitable environment for bacteria. Other options include sprinkling Ceylon cinnamon on her food to help dissolve food particles and a tablespoon of fresh mint, peppermint, cilantro and spearmint to inhibit bacterial growth. Your cat's gingivitis also means her breath probably isn't minty-fresh. Home remedies for this result of gingivitis can be effective at washing bad odor away. A mixture of two tablespoons of warm water and 1/8 teaspoon of Ceylon cinnamon squirted into your cat's mouth with an eye dropper will freshen her breath. Echinacea and goldenseal are also effective but require more work to prepare. Both are mixed with water, microwaved, cooled for an hour and strained. Keep in mind that bad breath can come from more than gingivitis; liver, kidney, gastrointestinal and respiratory illnesses are often associated with halitosis, so you should discuss her bad breath with your vet. Brushing your cat's teeth might be the best natural remedy for her good dental health. According to the Ottawa Valley Dog Whisperer, baking soda, Ceylon cinnamon, coconut oil and vitamin C are all effective brushing agents. Fragaria vesca does double-duty, also acting as a plaque-softener. It may take time and patience to get your cat used to having her teeth brushed. Begin by lightly massaging her gums with your fingers or a cotton swab. After she adapts to this attention, put a bit of your chosen toothpaste on her lips to get her used to the taste. Eventually you can transition to the paste on a toothbrush made for cats for gentle tooth brushing. Depending on the extent of your cat's gingivitis, she may need to see the vet for a professional cleaning so she can start with a clean slate on her new dental regimen. If she has an abscessed tooth, difficulty eating or mouth ulcers or cysts, she should visit her vet to ensure she does not become more sick and that there's not a more serious illness causing her problems.